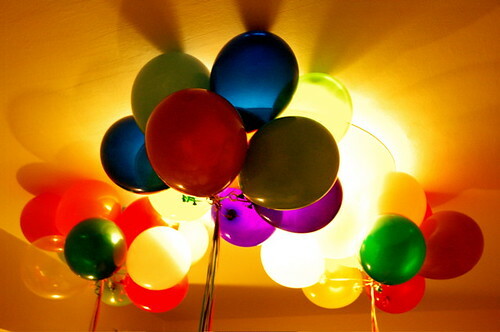 32 Balloons, originally uploaded by Wahj. A big Thank You to everybody for a wonderful birthday surprise ... It was the last thing I expected, getting a cake and 32 balloons in the middle of the last MoHAA game! Thanks to packrat and ondine for getting the balloons (how you fit all of them into your car I don't know) and to the guys for tolerating an interruption to the weekly fragging (we'll make up for it this week, with some quality time together, yeah?). The balloons caused quite the kerfuffle amongst the cats when we got home. Every cat inexplicably ran for cover as if these were the most terrifying things known to feline-kind. Iffy didn't even come out from hiding until noon the next day, when the last balloon was finally grounded. Patch warily accepted them after a few hours, but Twinkle was the true early adopter. After we'd let the balloons float up to our bedroom ceiling, trailing their ribbons like gigantic jellyfish, Twinkle jumped onto our bed and tried to play with the strings. As the balloons lost helium and bouyancy through the night, they began moving through the room, carried along by the currents of the air-conditioning and the fan, seeming almost sentient at times - the air-conditioning's at the foot of our bed, blowing down towards us, and so the balloons would tend to float down towards us, tickling us with their ribbons, then up, and back to the other end of the room. I woke up the next morning like a diver at the bottom of the sea, surrounded by strange floating creatures trailing long tentacles. By noon they were all grounded, and at sometime last night, the first balloon casualty was announced with a pop. Given that there's 3 cats, each with a sharp set of claws, in this house, that's quite a survival record for a balloon.